Greenpeace has declared Apple to be the most environmentally friendly technology company in the world for the third year in a row. The conclusion was reached in the environmental organization's latest report, entitled Clicking Clean: Who is Winning the Race to Build a Green Internet, which awarded Apple a final 'A' grade and a clean energy index score of 83 percent. 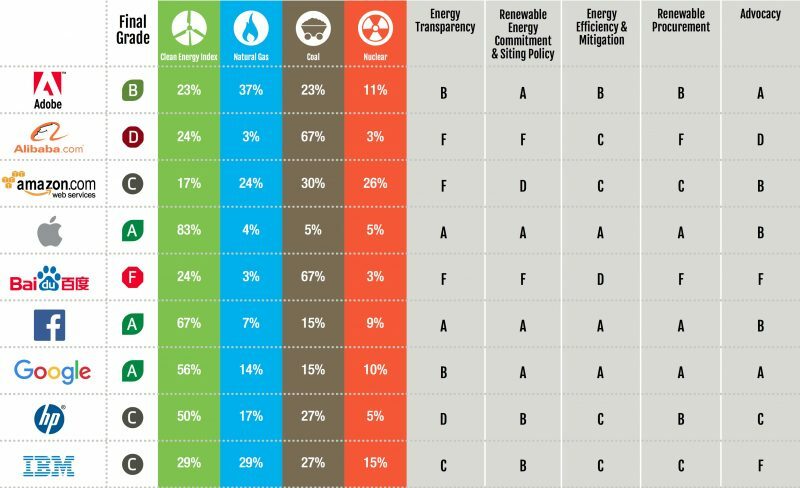 Facebook and Google also scored 'A' grades, with clean energy index scores of 67 and 56 percent respectively. "Thanks to the leadership and advocacy of companies like Apple, Google, Facebook, and Switch, we are seeing the tech industry make major strides toward powering the internet with clean energy," Gary Cook, Greenpeace's senior IT analyst, said in a statement. The report ranked companies on a range of green credentials, from energy transparency and renewable procurement to energy efficiency and mitigation. Nevada-based telecoms company Switch, which develops data centers, was the only company in its sector to be awarded grade A's across the board, with a 100 percent clean energy index. According to the report, Apple "played a catalytic role within its IT supply chain, pushing other IT data center and cloud operators who help deliver pieces of Apple's corner of the internet to follow their lead in powering their operations with renewable energy". Apple, Google, and Facebook pledged in 2012 to commit to 100 percent renewable energy sources. Apple's new Cupertino campus, which is currently under construction, will run entirely on renewable energy, thanks to an estimated 700,000 square feet of solar panels. Despite the positives in the tech sector, the report highlighted concerns with regards to emerging East Asian internet companies, which lack access to renewables from monopoly utilities in those regions. "Without key policy changes, the rapid growth of the internet in East Asia will likely be powered by coal and other dirty sources of electricity," the report stated. According to Greenpeace, the north and southeast Asian region is the world's biggest emitter of CO2. So soldered on components, throw away tech is green? I agree with you that Apple's latest hardware products are anything but "green", but this report is titled "Clicking Clean: Who is Winning the Race to Build a Green Internet". So things like renewable energy sources etc would be what GreenPeace was looking at. I wonder how Apple would fare if the report took into account the wastefulness of Apple's "Everything soldered on, throw away when no longer up to scratch" hardware. Isn't the title a little misleading? It has to deal with Apple's IT infrastructure not their mass produced products. No idea why you would think that makes any difference at all - and you can recycle any of these things at your local Apple store. If it's using highly recyclable materials? Why not? What's better? A more expensive device using less material (lighter) but is harder to repair that lasts 5 years or a cheaper device using more material (heavier) is easier to repair but isn't (typically) and last 3 years? Woah now, let's not start throwing around logic - someone is likely to get hurt. Fact is, their products have been more environmentally friendly than their competition for years too...glue or no glue. Says greenest tech company, not greenest tech company imaginable. Come on, MR, let's get more negative spin about this essentially good thing. You're not trying hard enough! Kudos for them, one area they have made a great effort. Though glued computers which are throwaway is horrible for the environment . My previous macs would have now been at the dump had it not been for their repairability. Mine too. Political correctness (green movement) is only for show. Being a previous member of several green organizations its obvious to anyone that cares to look that environmental groups are not about the environment anymore, but using the environment as an excuse for reducing freedoms, making money, and implementing some form of Totalitarianism where the rulers are supposedly smarter than us regular folks. Well done. Especially impressive considering the size of the operation.